Pickle Skeptics: Is Cyberlux Corp. (CYBL.OB) a real deal? The penny stocks underworld is abuzz with speculations about Cyberlux (CYBL.OB), a manufacturer of LED lights for both consumer and military applications. Let's take a look at the chart. After giving the chart a brief stare, one may speculate that something positive happened around September. In an ideal world, this positive spike would indicate financial health. Yes, it's easy to get blinded by hindsight, but the fact that a company deep in debt -- 2.5 million dollars deep, to be precise -- has been completely pardoned by compassionate investors following the news of the company and Boeing's BOA (Basic Ordering Agreement) is, well, amusing. We all love Boeing. Boeing is spectacular. But a BOA is not a purchase order; it is a contract that outlines terms of sale in case Boeing decides to buy. Boeing did like Cyberlux's price, that's for sure, but so far the only sale we've seen is the one made by the National Guard Bureau for $313,004. Even so, we can't figure out the net profit. Cyberlux manufactures LED lights, which are steadily gaining popularity due to the advantages they have over conventional lights. These long-life, color-correct, precisely focused, and energy efficient LED lights are a little too expensive for the consumer market, but they are penetrating into commercial sectors that use expensive machinery (e.g. machine vision systems), where even the price of LEDs is just a fraction of the overall cost. There are plenty of manufacturers that produce LEDs in this world. In fact, there are too many. Cyberlux will tell you that they have a breakthrough product, but the complexities involved in producing LED key-chain lights are mid-tech at best; most of them are produced by Chinese factories. However, Cyberlux did acquire two patent pending technologies developed at Rensselaer Polytechnic Institute and University of California Santa Barbara a couple months ago. According to a company-sponsored independent study, they have a combined value of $10 million. It is uncertain if any of these technologies are being put to use in the current line of products. Also, let's not be misguided; Cyberlux has nothing to do with the aerospace industry. Boeing's involvement in Secure Border Initiative (SBInet) is analogous to the role of a general contractor. Listen to what we mean, not what we say. It seems all too clear that we won't see significant profit from Cyberlux for at least another year or so. If by chance Boeing really decides to put in the maximum order of 500 units as outlined in the BOA, the deal would be worth $12,628,000. Guesstimating the net profit at 10%, it could be worth 1.25 million dollars, or half the current debt. What will happen to the stock then? No wonder why there are so many speculations. Cyberlux hasn't proven anything to the investors yet, but if news of Boeing's purchase is forthcoming, it could inflate the price of the stock dramatically. Still, we may not see any news at all. If so, the shareholders are in for a big trouble; the company doesn't have enough cash to sustain itself beyond 2008. 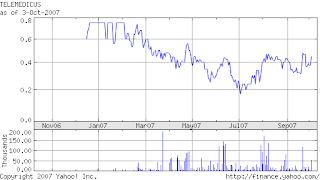 One positive factor is that UTEK Corporation (UTEK) currently owns 10% stake in the company. Pickle Stocks recommends CYBL.OB for day traders only. Readers who want to invest in Cyberlux as a long term investment should wait for the price to fall as low as possible (in reality, $0.005 is the most you should pay right now). China Holdings, Inc. (CHHL.OB) up 160%: Have you missed the boat? Today's penny stock winner is clearly China Holdings, Inc. (CHHL.OB), which went up 160% today ($0.05 open, $0.12 close) after announcing that they have just acquired Tong Kai Yu Minerals Co., Ltd. in China. The story is vague; after several conference calls with Pickle Stocks' colleagues on the street, we've determined that the news is harder to decipher than you'd think. Sure, China Holdings did acquire a company with substantial assets, including mineral properties with rare metals such as Vanadium (V2O5), Molybdenum (Mo), and Uranium (U). But to understand what's ahead, we need to dig deeper (pun intended) into the inner workings of mining assets industry. Bureaucracy plays a significant role in the mining industries throughout the world. You may say that we're stating the obvious, but maybe not. It is more than possible to determine just how much resource is buried in a given mine. Companies take risks when they know that they're about to make money. So in countries like China, winning the bid is half the work, and that takes a lot of effort, such as schmoozing around the Chinese bureaucracy. When you read today's press release, the real news seems to be buried in the labyrinth of acquisition details. Nobody knows whether or not China Holdings paid optimum price for the mine itself (if anybody claims that they know, then they've been to the mine); the next balance sheet will reveal this detail. But something our readers should be interested in is this: three exploration licenses that are part of the deal. This is what makes a mining company a mining company. This is what enables these stocks to jump 10 fold at a time (we're not saying it will, of course). Should you buy CHHL immediately? As a general rule, when a company gains over a hundred percent in one day, you shouldn't buy the very next morning. Too many people will hear of this stock tonight, and too many people will get greedy tomorrow morning. It is probable that you would see a lot of activities tomorrow morning, and better still, the stock might gain a few percent, but please take Pickle Stocks' advice and wait for the next big wave. If you didn't buy today, then you've probably missed the boat. If you plan on buying China Holdings, Inc. as a long-term investment, then you should at least consider buying ten more stocks in the mining assets business. This is a very risky venture with a lot of excitement, and often times, if you succeed 1 out of 10 times, you still win big in the end. Otherwise, don't. Seaway Valley Capital Corp (SWVC.OB): Is it time to buy? And so it seems that too many people were affected by the unfortunate crash of SWVC last Tuesday. If you were one of them, and you decided to stay in, kudos to you, since Pickle Stocks has a rather positive perspective to share. Too many day traders, Mozart. It's as simple as that. Day traders generally don't have a clue about the stock and the company they're trading; they're in, they're out. 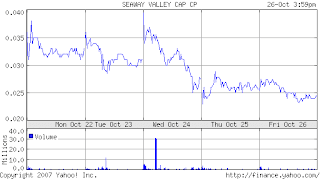 Seaway Valley Capital Corp. In decarbonization business? or retail? Simply put, it's in the business of buying and selling other businesses. Seaway is basically owned by one person, Mr. Thomas W. Scozzafava, who is the CEO and the only member of the board of directors. He owns 83.8% of interest in the company. That's a lot of shares for Mr. Scozzafava. When Seaway filed the 8K, and announced completion of merger between Seaway and Wisebuys, a lot of people were confused. First it was previous shareholders of GS Carbon Corporation (GSCR.OB) -- which was acquired by Seaway in August -- who saw that the decarbonization company they had invested in was now branching out to retail business; this is a bit confusing, to say the least. Then, other investors were weary of the fact that WiseBuys would drain a lot of resource from Seaway, especially with the acquisition of Patrick Hackett Hardware Company by WiseBuys. Concerns that Seaway might dilute its shares in order to raise more capital to support the acquisition abound on many online investment forums. All that aside, understanding which business Seaway Capital Corporation is in helps us see the company from a new perspective. They're in the business of buying other businesses, not running them. Also of note, Mr. Scozzafava was directly involved in the development of WiseBuys back in 2002. No wonder why -- Seaways is Scozzafava is WiseBuys. Does it help that Mr. Scozzafava owns 83.8% of shares? Maybe, unless he uses his power to dilute common shares. Pickle Stocks hopes to see a lot more news of acquisition coming out of Seaway in the near future, since they're in the business of that. As long as they continue to do so, there will be many points of exit and re-entry. Has it hit the bottom yet? We'd advise that you observe the market for a few more days, but one thing's for sure: they got rid of a lot of fat (day traders, etc.) on Tuesday. Most certainly, the next big wave will come from the news of Hackett acquisition, so keep an eye out for that. 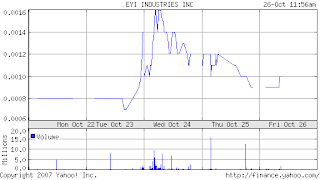 EYI Industries Inc. (EYII.OB): Series of rollercoaster rides ahead? It is an unfortunate fact of life: we penny stock investors thrive on volatility of stocks, not stability. In the last few days, Pickle Stocks has paid close attention to EYI Industrics, inc., which manufactures "wellness" products such as Calorad (subsidiary; EPII). It seems that many of our readers have picked up the recent announcement of new water filtration product called Code Blue. With new test results coming in from China -- especially now that they're nearing certification -- its no wonder that there's a lot of hype around this stock. There's are a lot of reasons to be excited about a company that sells water filtration products. Given that there are so many tech startups with no product and a lot of promises, this one looks much more trustworthy. Water is expensive. Take a bottle of Evian and compare that with a bottle of gas; you do the math. They don't bottle, but they are part of the industry. Plus, they claim to have established points of distribution through their partnership with EPII -- now, don't be fooled, EPII is a subsidiary of EYII; it's just so ironical that they have to announce this to the world. In reality, Pickle Stocks is not certain of the company's future; it just appears that EPII is starting a round of press release games that a lot of OTC:BB companies play in order to establish a legitimate place in the market. Do not forget: the company has also sneaked in another 100,000,000 authorized shares prior to their announcement of somewhat positive news from China. So the verdict is out: Pickle Stocks expects to see rounds of rollercoaster trends from EYII.OB in the coming months. We advise our readers to pay close attention to EYII's newest press releases. EYII is recommended for traders who are truly daring and have a lot of money to lose. Buy long, sell short, as some say. We've detected some heavy movements following the news of the Harvard Learning Centers'(HVLN.PK) plans to change its name to The Americas Learning Centers, Inc.(ALCI.PK). 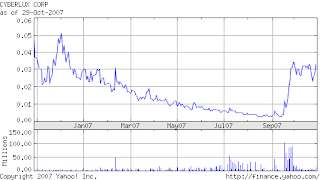 Perhaps it is easy for some investors to jump to a conclusion that this stock is somehow related to "the Harvard." But according to Harvard College -- one of the oldest and the most prestigious institution in the United States, to say the least -- they go very far to protect its name from being used in a false manner, which includes naming your pizzaria, "Harvard Slices." Pickle Stocks advises our readers to be very cautious of sudden movements such as this. Many buyers were probably jumping in the moment they saw the name Harvard. But Harvard probably has nothing to do with the company. In fact, their lawyers probably prompted this name change.